3-Wood Pole Semi-Strain or Double Dead-End. OPGW or ADSS fiber optic cabling. 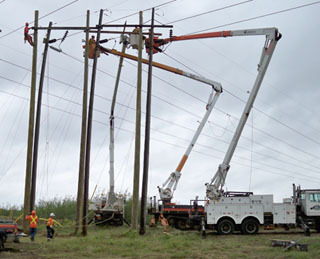 A&L is well equipped for on or off-road transmission line construction. Overcurrent and voltage surge protection. Underground primary and secondary cabling. Wind and Solar collection systems. A&L is well equipped for on or off-road distribution system work. Complete civil work including excavation, concrete foundations and containment pits, backfilling, site drainage, etc. Lattice and HSS steel structures and pedestals. 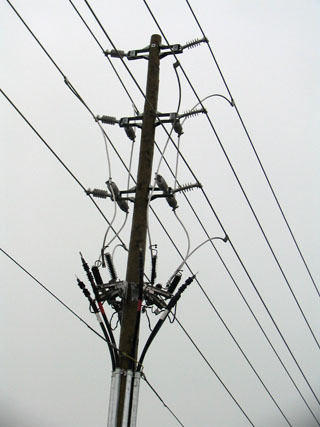 Overhead conductor bus up to 2000mcm Aluminum and IPS bus up to 6” Aluminum. Disconnect switches, circuit switchers, and instrument transformers rated up to 230KV. Transformer installations and replacements, rated up to 230KV and 300MVA. Jack and roll / jack and slide installations. 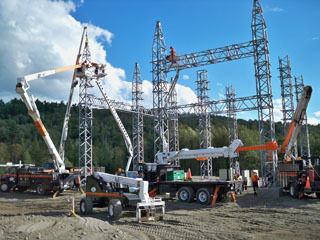 A&L offers turnkey design build substation and switching station installations.